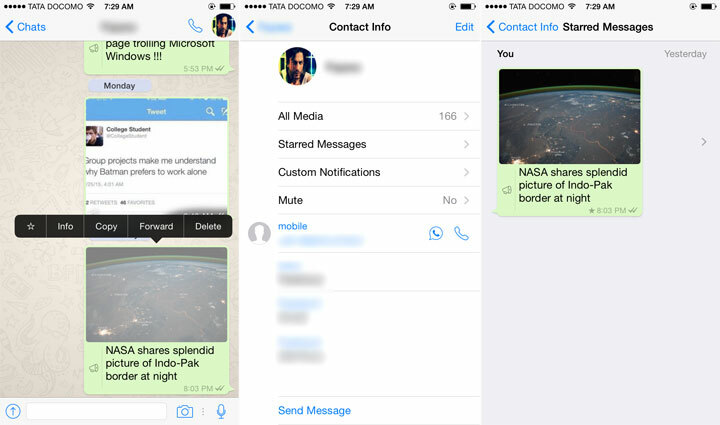 WhatsApp has updated their iOS application and added the feature of starring the selected messages. The Starred Messages will be bookmarked for further reference of WhatsApp users. Currently, the Starring Messages features is only available for iOS Users. Android and Windows Phone users will see this feature after sometime after WhatsApp updates its application. Once an iOS user updates WhatsApp, he can “Star” any selected messages. For starring the message, user have to Long Tap on any message to get the option. After long pressing, the “Star” button will be seen on the screen. Along with this ‘Star’ Button, user can see the options for Copy, Forward, Delete and Info. When user will select the ‘Star’ button, the message will be bookmarked and can be seen in Starred Messages area. WhatsApp is very lazy to roll new major updates for iOS users, but this time they’ve released one major update for iOS users first. Last time, iOS users seen WhatsApp update in the month of August, where the company introduced WhatsApp web for iOS users. Just head towards the Update tab in App Store and update whatsapp application.